Egypt Inbound Remittance Market has intensified due to high Egyptian migration in countries such as Saudi Arabia, Kuwait, UAE, Jordan, and more. Egypt Inbound Remittance Market has intensified due to high Egyptian migration in countries such as Saudi Arabia, Kuwait, UAE, Jordan, and more. Additionally, the increase in mobile users, banking population, and nuclear families are few of the major supporting factors that have helped in the growth of Domestic Remittance and Bill Payment Market in the country. Transform Evolution in Egypt Remittance Market: Remittance market in Egypt is still in the development stage and many transformational changes are required from the perspective of policy, technology, awareness and acceptance. 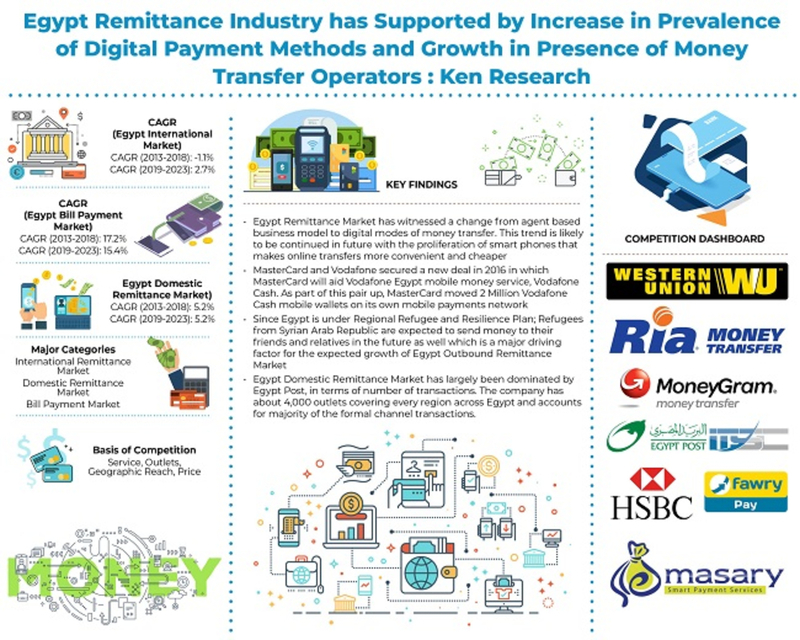 Transformation of Remittance Business Model in Egypt: The market has witnessed a change from agent based business model to digital modes of money transfer. This trend is likely to pertain in future with the proliferation of smart phones that makes online transfers more convenient and economical. This shift presents a technological challenge for existing companies which requires upgrading its platform that can support both traditional as well as the digital modes of services. The four electronic payment systems that are currently being used by aid agencies are pre-paid debit cards, smart cards, mobile money transfer systems and electronic vouchers. The most important benefits that were noted for all four e-payment systems include improved security for staff and recipients, reduced leakage, improved reconciliation and control of expenditure, greater speed and efficiency of transfers, reduced costs for the agency and recipient. Analysts at Ken Research in their latest publication “Egypt Remittance Market Future Outlook to 2023 – By Inbound and Outbound Remittance, By Mode of Transfer (Bank Transfer, Through Friends or Relatives, Through Agent or Courier, Carried Money on Their Visits, and Others), By Banking and Non Banking Channel, By Bill Type (Mobile Services, Internet Services, Utilities, and Others), By Bill Payment Mode (Cash Payments, Card Payments, and Fund Transfers)” expect the market to register a tremendous growth in terms of transaction value during the forecast period 2019E-2023E. The growth will be mainly driven by high growth in Bill payments system and rise in inbound domestic remittance. Inbound remittance from foreign countries has helped the country to earn foreign exchange and with improved penetration of banking and MTOs, the formal channel of money transfer is gaining prominence. Domestic Remittance Market is dominated by Egypt Post in which it holds about majority of the market share (in terms of transaction volume), followed by other banks and MTOs. Egypt Bill Payment Market: Bill Payment is the fastest emerging market and in the last few years it has seen a sudden growth mainly on account of rise in number of mobile and internet users. The sector has registered a double digit growth rate in the last five years and trend is expected to continue in the years to come. Mobile recharge has registered the highest transactions and is followed by bill payment for utilities such as electricty, water and others. Many bill payment companies such as Fawry, Bee: Smart, Masary and others have evolved over few years. Major payments gateways such as Mastercard and Visa have enabled many services for online bill payment.